The goal of game, introduced by Diana Larsen, is to efficiently form high-quality plans through retrospective analysis by recognizing factors that are within the team’s control. During retrospective activities, it is easy to hit a wall of unproductive blame. The moment the group reaches this barrier, “someone shoulds” and “if only you coulds” bounce around the room, knocking out any practical ideas for future advancement. Before determining what you can improve, you must first be clear on the dimensions you are able to regulate and what you need to adapt to. By identifying factors your team can control, influence, or cannot change, you can collectively discover how to respond to and overcome various situations. 2. 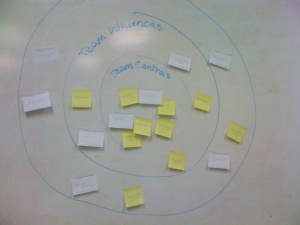 Hand out the sticky notes to your internal team members and describe the significance of each circle. 3. Allow time for each person to write their ideas on sticky notes. Once finished, ask them to post their notes into the respective circles. 4. As a group, collaborate to identify how each idea can be used to improve your project. Ask team members to expand on their ideas in order to further develop potential plans. In earlier stages of your retrospection, it is best to concentrate on “Team Controls.” This allows you to identify immediate actions that can be taken. As you see what works, you can alter potential plans and respond to any restraints. A neutral facilitator is recommended to keep the activity from becoming too emotional. Evaluating negative aspects of your project is a sensitive but necessary exercise, and can leave people feeling upset or hopeless. Avoid any discussions about blaming people or wishing something would happen. This frame of mind places the control out of the team’s hands, both halting all forward motion and creating a negative environment. Keep the atmosphere fun and enjoyable so people will feel comfortable sharing their ideas. You can instantly play the Circles and Soup online with as many members as you would like! Clicking on this image will start an “instant play” game at innovationgames.com. Players can edit the placement and description of each square, which everyone can view in real time. Use the integrated chat facility and communicate with your players throughout the game to get a better understanding of each move. Negative self-evaluating activities often end up emotional and unproductive. Take advantage of this game’s visual organization and extensive collaboration to avoid the blame and hopelessness that cover up ideas for future improvement. By identifying factors your team can control, influence, or cannot change, you can collectively discover how to respond to and overcome various situations. 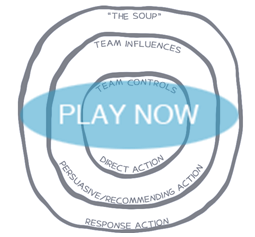 Play Circles and Soup to determine what you can do to avoid barriers and gain insight on what actions will most effectively enhance your project.